This past week we surprised our children with a secret vacation – destination unknown! All we told them was that they could bring one backpack and needed enough clothes and toys for two days. Yes, they would need a bathing suit. No, they couldn’t bring all their stuffed animals. Needless to say, we had A LOT of nervous energy and excitement leading up to the big reveal! 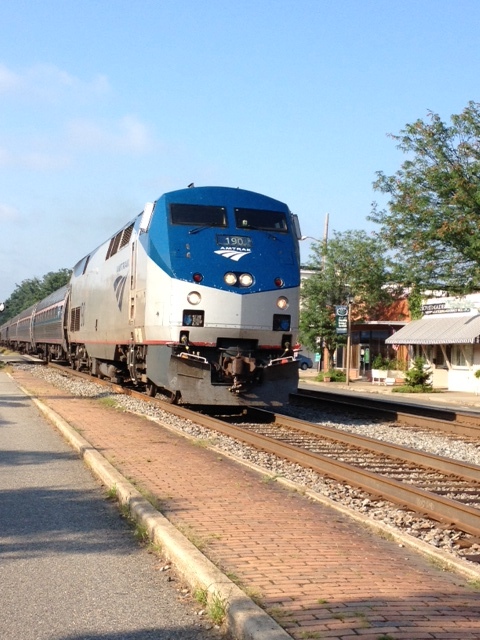 Our plan was to take the Amtrak train on a Sunday morning to Washington D.C. (an adventure in itself as our youngest child had never been on a train before!) Once there, we would hop on the Metro to get to our hotel and drop off our backpacks. From there we would walk to the National Zoo and spend the rest of the day there. 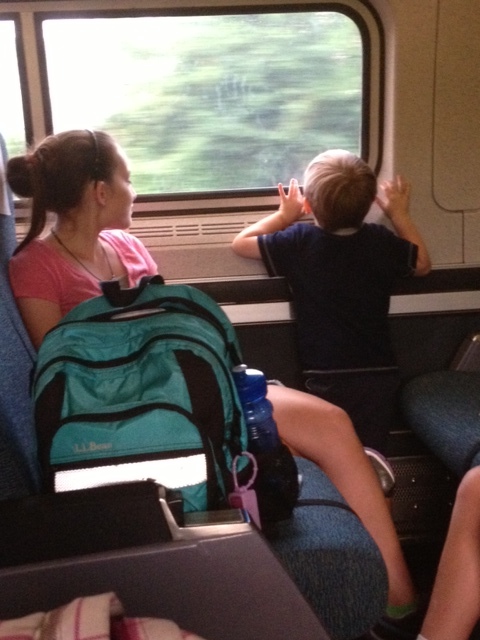 On Monday we would visit the museums then head back home that evening on Amtrak. Sounds pretty simple, right? Let me remind you… I have three children. One is a shy teenager. Very responsible, but a planner. Has to have things organized and done in order. One is an energetic nine year old. Easily distracted, especially with new things. My youngest is a slightly temperamental three year old. Need I say more? Thankfully I have a husband who runs marathons. Surely he could run after anyone that mistakenly got on the wrong train? The trip itself was indeed an adventure as expected. We never told the kids where we were going until we got to each destination which made every stop even more memorable. I took hundreds of photographs. We laughed. Ate. Walked. And walked. And walked. We realized the hotel wasn’t “just” off the Metro (more like a half-mile walk) and the walk to the Zoo? Yeah, add another mile to that. In 90+ degree weather. The Zoo visit was fun but excruitiatingly hot, except for the last hour. That was completed in a downpour of rain. Just another notch in our belt of family vacation memories, lol. The good news is we ended the trip with the same three children we started with. Mission Accomplished! As many of you know, I am always on the lookout for ways I can bless others with Random Acts of Kindness. 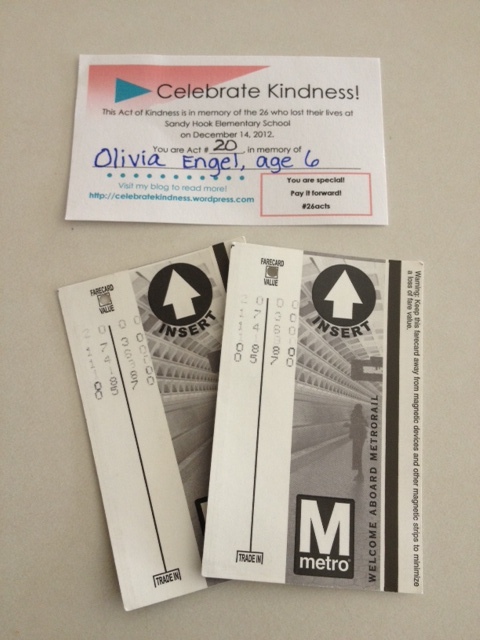 I realized halfway through the Amtrak ride that I left all my RAK cards at home, so I decided to focus on acts of kindness I noticed in others. You always hear the stereotype that city people are rude and uncaring, but I think comments like these flow from the mouths of individuals whose cups are half empty, not full. So I started a kindness list. I already had half a page before we even left our town! The train station doors were locked, so another lady came to me to offer alternative places that might have a restroom. As we boarded the train and got settled, the lady in front of us offered up her seat so a mom with two small children could sit together. My daughter, who was STARVING, shared her breakfast sandwich with both her brothers. She also offered to sit in the same row with them to help out. As our adventure unfolded, there were countless more RAKs to witness. A man giving directions to a family, obviously lost. The restaurant owner who took time to “chat” with my youngest child as we waited for our meal. My daughter offered to switch tennis shoes with me when I felt a blister starting to form. My son offered to hold the little guy’s hand as we walked through a crowded section of the zoo. A stranger named Leon chatted with me for almost an hour while I sat with a sleeping child in a stroller at the National Air and Space Museum. (Who, by the way, was the friendliest man I met on this trip. I learned so many interesting things about him! He was in town with his family celebrating his daughter’s graduation from high school. If you like country music, you can check out his online magazine!) It really is inspiring to take a step back and SEE all the kindness that surrounds you! I was especially appreciative to receive a RAK towards the end of our journey. My husband and I had split into separate directions (he went back to the hotel with my daughter to retreive our backbacks; I forged ahead to the train station alone with the two boys.) As I was exiting the Metro with my boys, my youngest decided THAT would be time time to throw a tantrum, as he did NOT want to get on the escalator without his sister by his side. 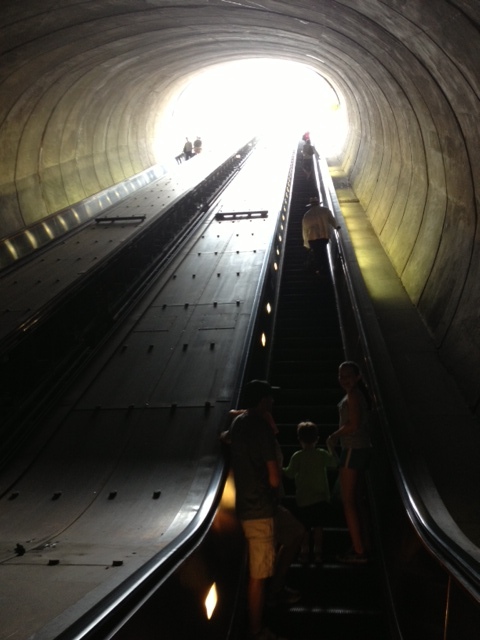 If you can picture a mobbed train station (it was 5pm after all), a tourist mom with a backpack, a zippered lunch cooler, two children AND a stroller… all trying to hop off a Metro train, take 5 steps, and step on a moving escalator. That, my friends, is a recipe for DISASTER! I wanted to hug him for all he was worth! Needless to say, we made it home unscathed; weary but happy. As I started to post vacation photos on Facebook the next day, I saw a message from a sweet friend who was traveling to DC later in the week. She called me to ask how my vacation went and we laughed about the various escapades I enjoyed throughout my visit in the city. As it turned out, her daughter was scheduled to play in a basketball tournament and was a bit leary of the Metro system. “What was your experience like? Be honest.” All I could do was laugh, because my experience was GREAT! And just like that, I completed Random Act of Kindness #20 without even realizing it. This RAK is dedicated to Olivia Engel, age 6, who shares the same first name as my cousin and the same middle name as my sister. Olivia was a great helper to her mom, often going out of her way to care for her younger brother, Brayden, who is the same age as my youngest son. She “developed an affinity for all things fun” and I’m sure she would have enjoyed all our adventures on this trip. You can click here to learn more about sweet Oliva. I hope this time of summer fun is filled with happy memories for you and your family. The Sandy Hook parents are experiencing their first summer vacation with a “new normal.” Be mindful to be present and aware of just how special these moments are in your life! Be blessed my dear friends!